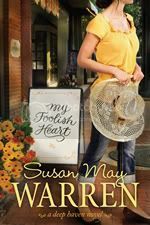 It is time for another LitFuse Blog Tour, this time for the book My Foolish Heart by Susan May Warren. I reviewed another book by Susan a few months ago, The Nightingale, which I really enjoyed. One of the things I particularly enjoyed about that book was that it was clear that Susan was familiar with the upper midwest. So learning that I could review a book that takes place in Northern Minnesota (where Susan lives) excited me. I was not disappointed. Unknown to her tiny town of Deep Haven, Isadora Presley spends her nights as Miss Foolish Heart, the star host of a syndicated talk radio show. Millions tune in to hear her advice on dating and falling in love, unaware that she’s never really done either. Issy’s ratings soar when it seems she’s falling in love on-air with a caller. A caller she doesn’t realize lives right next door. Caleb Knight served a tour of duty in Iraq and paid a steep price. The last thing he wants is pity, so he hides his disability and moves to Deep Haven to land his dream job as the high school football coach. When his beautiful neighbor catches his eye, in a moment of desperation he seeks advice from My Foolish Heart, the show that airs before his favorite sports broadcast. Before he knows it, Caleb finds himself drawn to the host—and more confused than ever. Is his perfect love the woman on the radio . . . or the one next door? Susan depicts 'Minnesotan' wonderfully. If you have never spent time in or near Minnesota -- outside of The Cities (that'd be Minneapolis & St. Paul, by the way) -- you may not catch it all. There are just so many little touches that made me feel 'at home' while reading this story. These are people like the people I grew up with, they felt real. I think they still would feel like "real" people, even if you've never been to Minnesota. Susan depicts high school football incredibly well too. I think especially small-town high school football. You can tell she relied on her sons and their coach for assistance in writing the football aspects -- everything just rings true. This isn't a "football story," so don't shy away from it if you don't like football! Football plays a role though, and it is well-written. The story has multiple plot lines, and all of them were interesting to me. There are the two love triangles mentioned above (Issy/Miss Foolish Heart falling for a caller but also falling for her next door neighbor, and Caleb falling for his neighbor and then also for Miss Foolish Heart). But there is also Issy coming to terms with reintegrating back into life after a horrific accident that has left her emotionally confined to her home and prone to panic attacks. Agoraphobia is what she suffers from, which is the fear of having a panic attack in public. Issy's stress is portrayed so realistically, I would find myself feeling a bit panicked when she got into "scary" situations (like going to a grocery store). And there is Lucy (Issy's best friend) and her fight to keep the family business and her fear of letting everyone down by losing it. I loved this storyline. I particularly enjoy when the secondary characters and secondary storylines are fleshed out so realistically. Plus the star quarterback, Seb, has come back to town and is competing for the job as head coach of the high school football team. Oh, the spiritual and life applications in their completely different approaches to coaching. Fabulous, even if you don't particularly like football. Seb has a difficult past that he is trying to overcome. He is afraid, too. Afraid of not following through, not completing what he starts. He may have been my favorite character. And Seb and Lucy have a painful romantic history as well. Mistakes were made years ago, and they both hurt. And they are both afraid to love again. Lucy is probably the character I identified with the most as part of this storyline. I really wanted a happily ever after of some sort for her. Healing. I wanted her to feel whole. If it didn't come across, dealing with fear is an overwhelming theme. Everyone is afraid of something different, but Perfect Love casts out all fear. The characters -- and dare I say the readers -- need to truly rest in that Perfect Love. As part of this blog tour, you can win a night on the town. Go check that out too! A doughnut works! Thanks, I needed to laugh aloud this morning! !